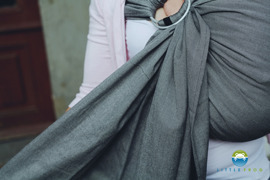 This is a 2nd quality wrap - with minor imperfections. Wrap may contain small spots, folds, broken knits or discoloration. Keep in mind that even though it is 100% secure and safe to use! Remember that the family of Ammolite wraps is designed for the smallest and older children as well - they are a little thicker than other Little Frog wraps (240 g / m2).